Billy clubs were already out when the violence began... Will 2012 and NATO be a Chicago memory like 1968 and the Democratic National Convention? It was clear that the confrontation was planned. And when the police penned in a group of protesters at the corner of Cermak and Michigan, things became very difficult very fast. The violence escalated, as the videos below show. The police, who had been ordered, as far as Substance could see, to display their billy clubs during all of the NATO protests, moved in and began swinging at people. According to Occupy organizers, a "kettle" is when the police pen in a group of protesters on all sides, then squeeze. The result is usually the violence that may or may not have been provoked prior to the "kettling." "This was very similar to what happened in the weeks before the Democratic Convention of 1968," Substance reporter George Schmidt told this reporter later. "In May 1968, the Chicago police created a kind of "kettle" — the term didn't exist at the time — during an anti-war protest in Chicago's Civic Center Plaza. Police on the east side ordered protesters to move west, while those on the west side ordered the protesters to move east, and the squeeze resulted, predictably, in major violence. During the beatings, police told anti-war protesters, many of whom were pacifists, that this was a warning to stay away from Chicago in August" [When the Democratic Convention was scheduled to come to town]. Police in riot gear were displaying their billy clubs throughout the protests against the NATO Summit in Chicago. 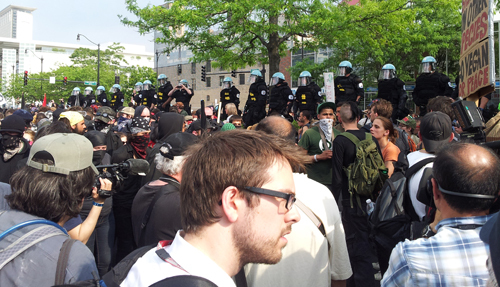 Above, on May 20, 2012, the police had taken the high ground above the street level protests at Cermak and Michigan just before the violence began. Substance photo by John Kugler.Deja vu all over again? Chicago in August 1968 didn't have You Tube and camera phones. It took months before the so-called "Kerner Commission" (part of a governmental investigation called to look into the "causes and prevention of violence") came out with its report on the August 1968 Chicago demonstrations at the Democratic National Convention and the report called much of what had taken place a "police riot." That report, written by a commission chaired by Illinois Governor Otto Kerner, went into detail. But as the protests against NATO continued on Sunday, August 20, it looked like "deja vu all over again." And by the end of the day on May 20, it was clear that there had been police violence against the protesters and that the city had also deliberately underestimated the huge crowd that marched towards the NATO meeting. 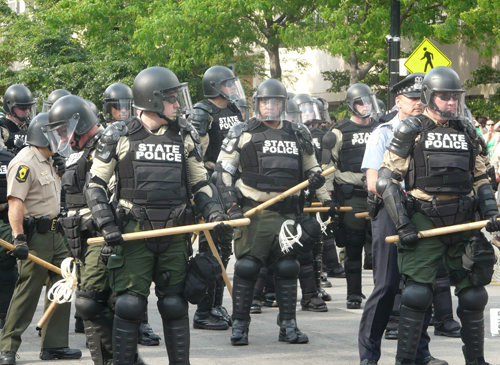 In addition to being equipped with extra-long billy clubs, Illinois State Police along the line of march on May 20 (above) were ordered to remove all identification and to display their weapons in a menacing manner. This deployment of the Illinois State Police has been observed by Substance reporters since the March and May 2006 immigrant rights marches in Chicago, and has never been challenged by lawyers or corrected by Illinois state officials. Substance photo by Kati Gilson.Flash forward to May 2012, at Michigan Ave. and Cermak Road in Chicago. NATO leaders are meeting in McCormick Place, a few blocks to the east, but even mainstream corporate reporters have been forced to cover the stories from a viewing room on closed circuit TV. Meanwhile, on the streets, protesters were demanding to get closer to the NATO war makers. Are we seeing the same thing in Rahm Emanuel's Chicago in May 2012 that the world say in Richard M. Daley's Chicago in 1968? Sadly, it appears to be the case. One of the things that was obvious to careful observers since the NATO protests began was that the police (all of them: City of Chicago; State Police) were under orders from their superiors to display their billy clubs. Every Substance reporter who covered the various events showed this. And in general there was no reason for it except as a macho show of force ordered by Chicago Mayor Rahm Emanuel and his hand-picked police chief, Garry McCarthy. Another fact established by Substance staff members was that Chicago police had been told lurid tales about preparations to throw nasty materials at the police (just as had been claimed during the 1968 protests; later it was learned that most of the provocations had come not from protesters by from agents provocateurs). On a personal note: I got back home from covering the May 20, 2012 march after getting hit four times in my head (lucky I had a helmet on). I also lost a shoe. I'll remember to wear high tops next time. (The day before, George Schmidt had told Substance reporters not to wear sandals when covering the protest; very good advice). On the corner of Cermak and Michigan there was a stand off where police kettled a group of protesters using riot police. The police moved in on the protesters and violence ensued. I saw a few people with busted heads and bleeding. There was no regard for safety or the lawful right to assemble. I will upload video later were police told me even if I was press it did not matter, "higher ups" told them to take care of everybody. Look at pictures and video. Everything was fine until riot police kettled protesters and created chaos. I did see protesters throwins sharp sticks, water bottles and other items at the police. I wasn't close enough to the middle of the fracas to observe, but trust John's observation and video. Especially since I saw him walk up minus one shoe. Some protesters, who refused to disburse, were "pushed" by the police towards the "exit". They held their batons in both hands and pushed as needed to move the few people. Noone that I saw was pushed violently or to the point of falling. It was a long, slow process to move the last few hold outs from the site. As I was leaving and walking back towards State and Harrison, after walking quite aways west due to police blocades, I saw numerous police on corners, the swat team lined up in front of the police station and numerous ambulances, with sirens blazing driving towards the area I had just left. It will be interesting to see the final result when all the photos and investigations come out. Yes they were prepared with riot gear, helmets, face masks, batons, horses, bikes and vehicles. I'm glad I didn't have to wear all that gear, it was hot! At last note Substance stalwart reporter John Kugler has been bruised up needless to say, and his head has been spinning. Kugler is a union activist himself. Sad that my neighbor was clubbed four times by a cop that lost it, as he is a great neighbor also, wanting to organize the neighborhood as well, to make for a healthier community for our youth to grow up in. We thank you brother John Kugler for having reported on the NATO protests. Rob, I'm not sure what you're claiming is inaccurate in the Sun-Times report. You say that you "saw zero members of that group in body armor," but surely you're not saying that just because you didn't see it, it wasn't so? I helped write the Sun-Times story and I saw several Black-blockers in motorcycle armor with my own eyes. Yes, Several reporters were wearing helmets. Not sure how that alters the fact that Black Bloc members also were? The story didn't say that the flag poles were used to attack anyone, only that sticks were thrown. FWIW the sticks I saw thrown WERE the kind that some Black Bloc members were using as flag poles, but I didn't see the heftiest poles thrown. I knew what I was getting into when I went to report that part of the stories we were all covering. That is why I came prepared with a helmet and safety glasses. I was there to report what was happening, what I saw myself and what I could photograph and video as a reporter. In the end the police did their job as they had been ordered. I am just sore (physically) and grateful that in the end cooler heads on both sides prevailed and that even after the clashes and beatings the situation was de-escalated. The protesters were there to exercise their First Amendment rights. The police were there to enforce the mayor’s orders, and we reporters were there to report what happened. I will be working on a more comprehensive report of what I saw that day from the start of the rally to the end on the corner of Cermak and Michigan in regards to how and why the rally ended the way it did. Just now, i have to relax for a few days and help out with the rally May 23, and covering the news now that NATO has left town. Among the comments of the valiant Iraq Veterans Against the War, IVAW, were: "this is for Bradley Manning," the soldier proclaimed, tossing his medal in the direction of the NATO summit. Manning, the Daniel Ellsberg of his day, who blew the whistle on the horrors of Viet Nam that had been kept secret, with the Pentagon Papers, published by the New York times over four decades ago, Bradley Manning is an imprisoned veteran for having been accused of alledgedly releasing sensitive information, as you know,to wikileaks. Julian Assange, the founder of wikileaks, though under the same scrutiny, to put it mildly, as Bradley Manning, meanwhile was nominated for the Nobel Peace Prize in October of 2011. Another veteran welcomed the protestors of all political stripes while tossing his medal, stated that, "we shall kill no more for you NATO." There were vets of the on going war in Afghanistan as well at the front of the march. Needless to say they are afainst the war as well. Some 40 veterans threw away their medals awarded them by the military industrial complex, offering that NATO take them back. Civilian casualties, need we be reminded, in Iraq between 2003-2012, according to Iraqbodycount.org are between 106,749 and 116,609 with other studies going much higher. So how much higher will the toll go in Afghanistan? Since the soldier that lost it, and went on a rampage stalking and killing civilians going door to door, the burning of the Koran, and soldiers caught urinating on dead bodies, the per centage of Americans that oppose the war, and want US troops out of Afghanistan immediately has skyrocketed to 80% in favor of a withdrawal before 2014, preferably much sooner. As you are no doubt aware, last night on WTTW Superintendent Garry McCarthy stated very clearly that CPD had undercover officers among the Black Bloc and larger demonstration on Sunday. He also clearly stated he was recieving real time information from them during the demonstration. So if Ms Janssen saw individuals among the Bloc in body armor it possibly could have been these undercover agents, but then maybe not. Having now had the chance to look at about 35 minutes of video and about 150 still photos I admit there was clearly one individual with a trash can lid fashioned into a shield painted red in the front ranks of the conflict. I saw no others in any of the video or photos, nor in person.I still have not seen a shot of anyone among the Black Bloc wearing body armor. At least 100 of the Bloc ran by me immediately to my left at about 19th and Michigan on Sunday. Only about 1/3 were wearing face coverings at that time. Some members of the Bloc formation were very young, maybe even high school aged which did freak me out to be honest. One member of the Bloc or possibly an undercover officer advised myself and another demonstrator who was accompanying several people using wheel chairs to move as far as possible from the stage area once we got to Cermak because of the need to protect these disabled demonstrators from potential violience. I am not going to argue that ideologically the bloc does not advocate militant attacks on the police, but to depict the Bloc in mass as being prepared for war as Ms Janssen's Sun Times article did was highly inaccurate. The quote I extracted was the most explicit example of that over-reach. There are numerous Bloc want to be's, and many disappeared apparently when things did get rough. Unless the State's attorney drops the two felony charges that grew out of the arrests on Sunday it is likely these undercover officers will be revealed. At that time it may be possible to determine what if any role they had in the Bloc's push into CPD lines that appears clearly in video clips. Story still getting out: "PR spin versus video reality"
Substance reporter John Kugler's report from the front lines on the NATO protests in Chicago, is now posted on Indymedia.org which is not just national, but international. The story was also sent to news agencies across the country. The Chicago Indymedia article entitled "The two faces of NATO: PR spin versus video reality," is posted along with articles about Belarus, Poland, Puerto, Argentina, a story about an ACLU protest in front of the White House about Washinton DC and statehood, and other stories from Portland to New York City. Needless to say, Substance too goes out nationally and internationally, so help support Substance by Subscribing to Substance, if you haven't, just $25. / year.